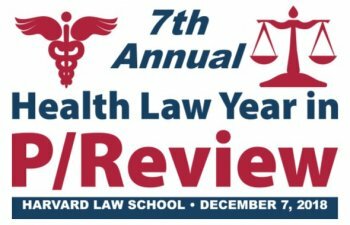 Join us at the Seventh Annual Health Law Year in P/Review symposium to hear leading experts discuss major developments during 2018 and what to watch out for in 2019. Speakers at this day-long event will cover hot topics including health policy under the current administration, pharmaceutical policy, reproductive health, and public health law. Organization/Sponsor: The Seventh Annual Health Law Year in P/Review is sponsored by the Petrie-Flom Center for Health Law Policy, Biotechnology, and Bioethics at Harvard Law School and the Center for Bioethics at Harvard Medical School, with support from the Oswald DeN. Cammann Fund at Harvard University.